The Relais Correale offers such a location just ten minutes walk from Sorrento’s main square. Recently renovated it stands in a private park of 8000 sq meters with olive, orange and lemon groves and vegetable gardens to supply fresh produce for guests. Every morning at breakfast you will find the fresh pressed citrus oranges, orange marmalade and lemons, plum cakes, muffins and cakes made on site. 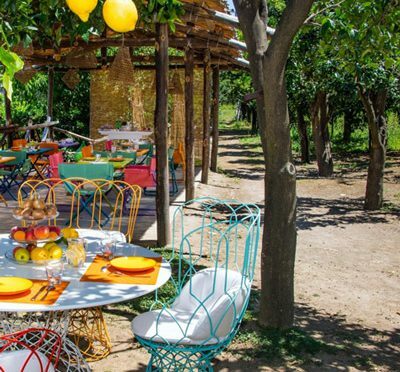 Eat under the shade of the lemon trees or in your room. Evening dinner is available on request and menus offer local dishes with fresh garden produce. Each room has its own distinctive style with carefully selected and customised furnishings. Junior suites have an independent entrance and a private patio area. You can view all the rooms on their website. The Relais Correale has a special arrangement with the Marameo Beach Resort which is a pleasant twenty minute walk through the old town and its entrance is opposite the public lift. For stays of seven nights there is free entry on two days for two people and a complimentary dinner.